The cities of El Paso and Ciudad Juárez almost appear as an elevated oasis in the northern plateau of the arid Chihuahuan desert. Surrounded on all sides by a combination of rocky mountains and expansive desert, the two communities—like other border city pairings—share not only an arbitrary border, but a culture that is strikingly different from that found in either’s respective country. They are truly sister cities in every familial meaning of the phrase. From this intimate connection, a vibrant ethnic identity was birthed, creating variations of established mediums of art.The medium most influenced by this dynamic is music. The cities sit at the crossroads of what some may deem Latin and English music. And though some some may prefer one to the other, there is a growing scene embracing their love of both. One of the emerging groups from the area is The Chamanas, whose fusion indie pop takes sounds and structures that are familiar but rearranges and reinterprets them in a fresh new way. The origins of the The Chamanas began in 2011 when keyboardist Fernando Fonseca, bassist Manuel Calderon, and guitarist Hector Carreon worked together at Sonic Ranch recording studio in Tornillo, Texas. All three were sound engineers at the highly regarded studio and worked on records for artists such as The Yeah Yeah Yeahs, Animal Collective, Gogol Bordello and Portugal. The Man. “We met at Sonic Ranch. Then after some time we had some good demos and our good friend David Garza motivated us to start playing the music live,” he said. 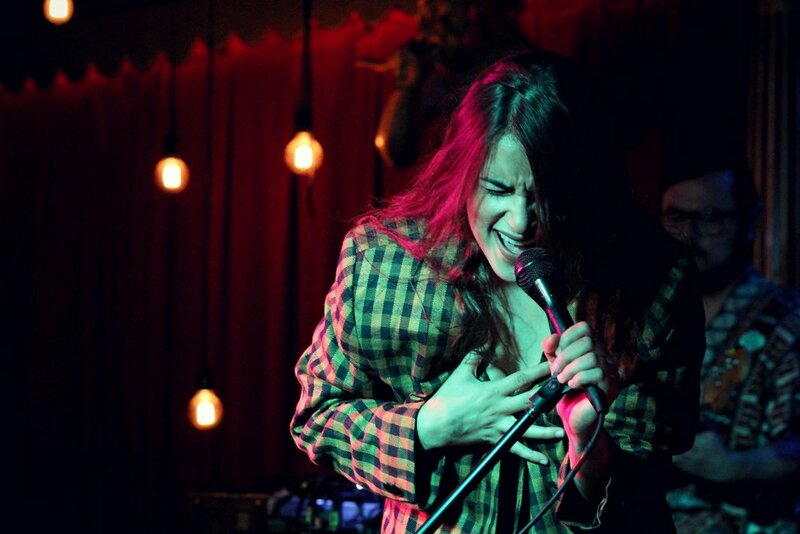 The band brought in Amalia Mondragón as lead vocalist, and soon attracted interest from several record labels, eventually signed to Nacional Records in Los Angeles. The group wasted no time, soon recording their debut album at the place where it all started, Sonic Ranch. It was during these sessions that drummer Alejandro Bustillos joined the group. The result was the LP “Once Once,” for which the band would be nominated for Best New Artist at the 2016 Latin Grammys. After the release of the record, the band and vocalist Mondragón decided to go their separate ways leading to the arrival of current vocalist Paulina Reza in 2016. “We have known her for a while now. I have worked with her before on other projects I have produced. When we needed a singer for the project we had auditions, and Paulina was the best choice and fit,” Fernando said of Reza’s addition. “Musically and style, we have tried to keep the same essence as before but obviously Paulina has her own style and have adapted that into the project. She has fit in perfectly into style of the band,” he added. “Also, the music has evolved also according to the different situations we’ve been through. Some very pleasant and some very tragic,” he said. The sound of The Chamanas is similar in composition to the band’s hometowns, taking their favorite parts of the two cultures and combining them together to create something distinctive. The band remarks, “We definitely have lots of influences from both sides [of the border] not only musically but also in our lives.” They note that they are fans of the way Boleros and Ranchero music is composed. In addition to traditional Latin styles, members of the band consider far flung bands such as Natalia LaFourcade, Interpol, Phoenix, Tame Impala, Portishead, Kings of Convenience, and the Flaming Lips as major influences. The band’s sound not only spans geographic distance but also time. The group adds elements, such as feel and style, of songs written decades ago because they “like the lyrics and the music arrangements from back in the day.” The band works to incorporate that style of songwriting with synthesizers and digital recordings. The music of distinguished artists such as Juan Gabriel, Jose Jose, The Beatles, and Los Angeles Negros play significant roles in the band’s songwriting. The Chamanas consider both the cities of El Paso, Texas and Ciudad Juárez, Chihuahua as their hometown. The metropolitan area of the two cities is isolated, with no other major cities located within hundreds of miles in every direction. This type of seclusion and lack of infrastructure to nurture development made it difficult for local bands and artists, with a few notable exceptions, to get noticed, signed, and reach any significant level of success. However, the group said this dynamic is quickly changing. “Promoters are starting to bring more outside acts into El Paso. Lowbrow Palace and Tricky Falls are major venues in El Paso, along with smaller bars like Monarch and Lovebuzz which host numerous touring bands. And now that the members of the group have reached a significant level of success, they wish to give back to the community that formed them by “trying to push other local acts in the mainstream” by producing and collaborating with them, consulting with them and helping them promote their music. One of the early breaks the band had was in 2015 when they released their Spanish cover of Portugal. The Man’s “Purple Yellow Red & Blue.” Fernando recalled how it all came together: “I had the privilege of working with them on a couple of records they recorded at Sonic Ranch. John, the singer, had the idea of having different bands from different countries do a version of one of the records and he asked me if I knew a good Mexican band that would do ‘Purple Yellow Red & Blue’ in Spanish. Fernando mentioned that he had started a band and they could do it. He recalls, “The initial idea was to record over their instrumentation and just record the vocal in Spanish. As a joke, one of the verses we wanted to do that in a Mexican traditional way but with modern instruments.” The group ended up liking what they did and suggested doing the whole song in that style. Another prominent collaboration looms on the horizon for The Chamanas. This time with Seattle electronica duo ODESZA whose forthcoming album, A Moment Apart, will feature the band on the track “Everything At Your Feet”. According to the band, it all started when a friend showed Harrison Mills of ODESZA The Chamanas’ music and contacted them asking if they would like to collaborate. “We are very happy to collaborate with artist from other countries and cultures,” Fernando notes. For The Chamanas their embrace of both Mexican and American cultures starts with their name. “Chamanas”, the Spanish form of “Shaman” but instead of pairing it with the proper Spanish article “Las,” they use the English article “The”. The haphazard mixture of English and Spanish, aka “Spanglish,” is very common in border communities. “The four of us in the band we grew up in very different ways and have a different perspective from growing up in the borderland,” Fernando said. However, residing in El Paso and Juárez has not only impacted the members of The Chamanas as musicians, but on a psychological level as well.